Both room and apartment are fully furnished with your comfort in mind, but you’ll have to bring along your own bedding, as well as clothing and personal items too. Don’t forget to ID for check-in. You’ll find a few pay and display spaces nearby that you can use while you unpack your things. Please head straight to reception: Dorset Point, 107 Dorset Street Upper, Dublin 1, Ireland. Once you’re here, someone from the Dorset Point team will greet you, provide you with further information and give you your key fob. If you’re anticipating a late arrival out of hours, be sure to notify us so we know when we can expect you. All our residents must be a student, enrolled in a college/university and be 17 years or older at check-in. If you’re paying in instalments, you’ll need an Irish/UK guarantor. Otherwise, you’ll have to pay your licence in full in August. If necessary, legal action will be taken in order to recoup the missing rent. If you make the decision to pay in instalments, your guarantor will need to send us an Irish/UK utility bill and provide the necessary information – the exact details will be provided by email. Get in touch with reception and they’ll have you fill in a quick repair form. A member of our facilities team will fix the problems with your room or apartment as soon as possible. If you need to share something with us, the on-site team are always on hand. Before you have a chat with us, we’d recommend contacting your university support team first, since they may be better suited to offer you advice. If you’d still like to speak to the Accommodation Manager, you’re more than welcome to meet up with them and talk things through. You’ll share a post box with your new housemates and get a key, so you can check on your post whenever you like. Reception will look after any parcels you have delivered too, just bring ID with you when you come to collect them. This property does not offer parking on site. Yes, our residents can use any of the bike storage facilities on site. You’ll have to clear out your room and leave it the way you found it, since nothing can be left behind. Once that’s done, please hand in your fob to reception. Don’t forget to say your goodbyes and be sure to have an awesome summer, too. Aside from our twin rooms, all other rooms in this property are single occupancy, with a private shower room. You and your housemates will share cleaning responsibilities. It might be worth keeping a rota in place, so you can stay on top of the cleaning. Collection of your rubbish and recycling from the bin stories is included as part of your licence fee. We’ll take care of cleaning these areas, though we’d appreciate if you kept them as tidy as possible too! Dorset Point and its grounds are strictly non-smoking but you’re welcome to smoke off-site when you’re outside. You can! When making your selection online, choose the same apartment as your friends and we’ll make the arrangements. If you don’t know anyone when you’re moving in, it’s no problem – you’ll have plenty of time to make friends once you’re here. Sure, let us know your preferences when booking and we’ll get that sorted for you. Absolutely, anyone can visit, but you can only have guests stay in your room for 2 nights a week. You must be with them the entire time and be able to sign them in once they’ve arrived. You’re responsible for them – they must be signed in and out, and follow all aparto regulations during their stay. Sure, we won’t stop you, but please be respectful of other students living in the building, and give things a clean when you’re finished. We’d love to meet you! Please call us on +353 1 685 5690 or complete our tour booking form to book a viewing. That’s fine, get in touch and we’ll make any necessary changes. 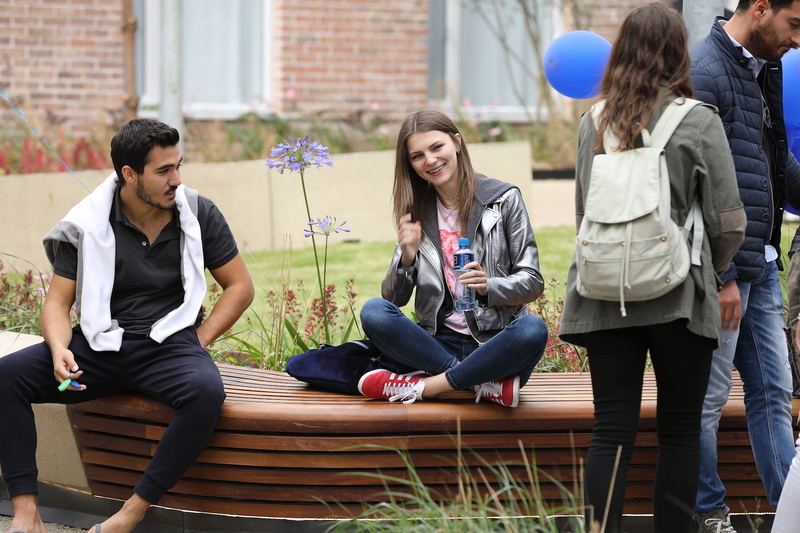 You’ll see Dorset Point’s communal areas, including the common room, study room, gym and outdoor areas. We’ll also show you around an apartment and a bedroom to help you get a feel for things. You most definitely will since it’s included as part of your rent – you’ll also have a broadband connection on your room’s desk for extra speedy connections. You’ll find a TV in your communal lounge area, though residents are responsible for paying for the TV Licence themselves. Things like utensils, dishes, pots/pans and other small kitchen appliances are not supplied however, so you’ll have to provide these yourself. Personal fridges are for storing prescribed medications only, sorry! Bring your own bedding along with you as we don’t supply any. Our rooms have a 4ft bed as standard, so double bedding is a good rule of thumb. Residents can top up a laundry card or a phone app that gives them access to the property’s washing and drying facilities. It’s super easy, so you don’t have to wait until your next visit home to clean your clothes. Go ahead! That’s what turns a room into a home. We’d love it if you returned the room back to its original state though, otherwise you might incur some charges. Sadly not – it can be paid in full in August or as instalments in August and in January only. Providing it’s at any time from the start of your tenancy ‘til the end, you can stay in your room over any break during term time. Get in contact with us to check availability. Once we’ve set the dates of the licence, we can’t change them.